"Superman and the Legion of Super-Heroes, Chapter 1: Alien World"
Alrighty, yesterday I threatened to (eventually) follow-up with Superman's Legion of Super-Heroes story-thread... and not wanting to waste any time (and because my Action Comics boxes are some of the few I can currently access)... here we are! 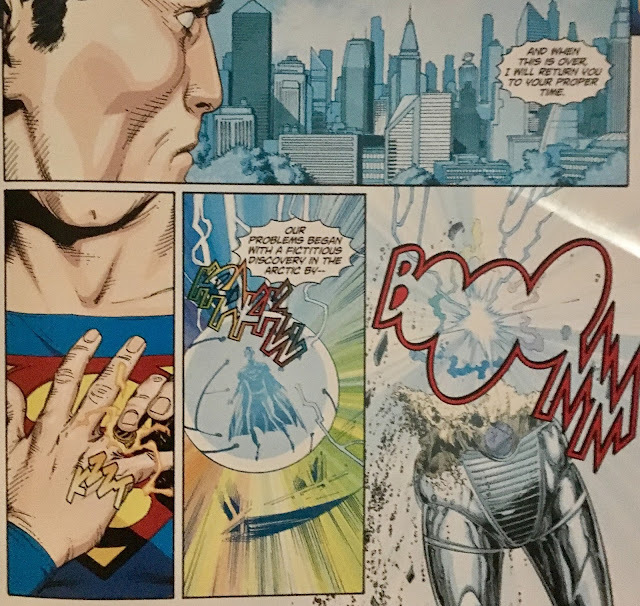 We open with a pretty familiar sort of scene for Superman fans... only instead of it occurring on Krypton some twenty-five years back, it's happening on some war-torn planet in the year 3008. 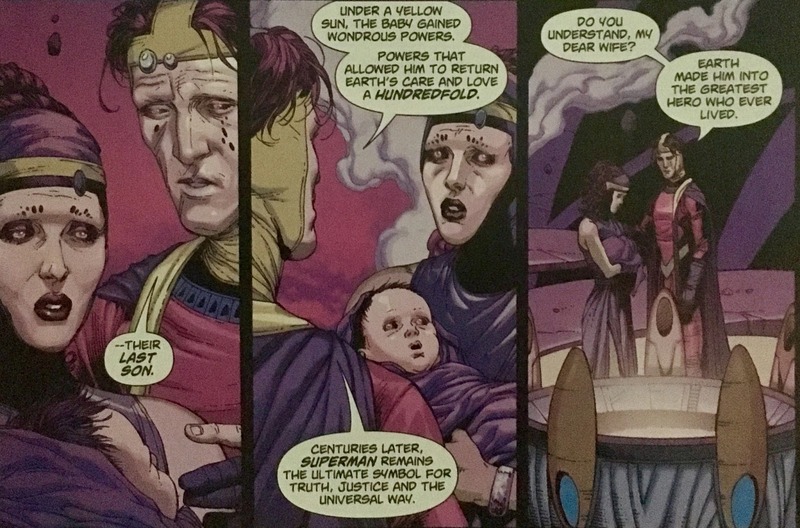 With the war threatening to destroy their entire world, a husband and wife decide to send their young child to Earth... and even cite the legend of Superman. The baby's pod launches just as the planet goes to pieces... and we follow him, all the way to a futuristic Smallville. Stop me if you heard this one before... his craft is discovered by a pair of middle-aged Smallvillians. This is Juun and Mara... we might assume that their last name is Kinnt or something. Now, they watch the baby crawl out of the wreckage all wide-eyed and optimistic... however, instead of embracing the boy... they pull a gun on it. Ruh-roh. We shift to the present day, and join a decidedly more geeky than I'm accustomed to seeing Clark Kent rush toward a closing Daily Planet elevator. The folks inside think this is quite the hoot, indicating that they don't seem to respect our main man here. There's some fallout from Infinite Crisis I don't dig. Jimmy Olsen wanders up and offers Clark a soda, but their chat is interrupted by the arrival of... a decidedly more ornery and detached Perry White than I'm accustomed to seeing. 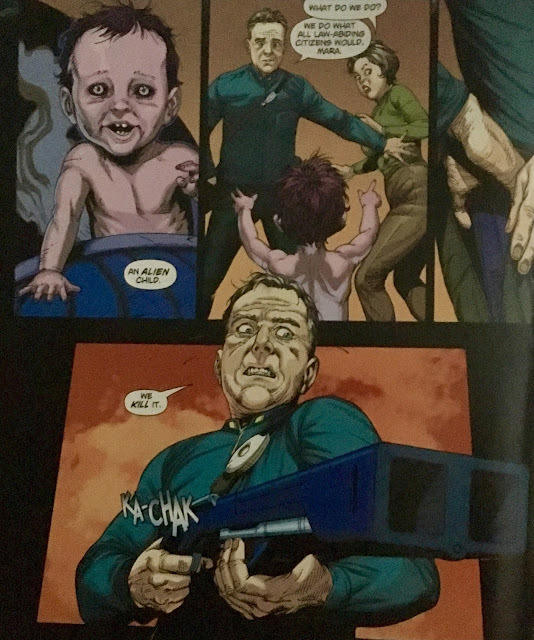 He yells at young Olsen (well, that's about right) about a bad picture he'd taken of General Zod. Ya see, it has a white line down the middle of it because he was standing so close that a piece of debris shattered his lens. Either way, the Chief ain't impressed and sends the geek to get him some coffee. 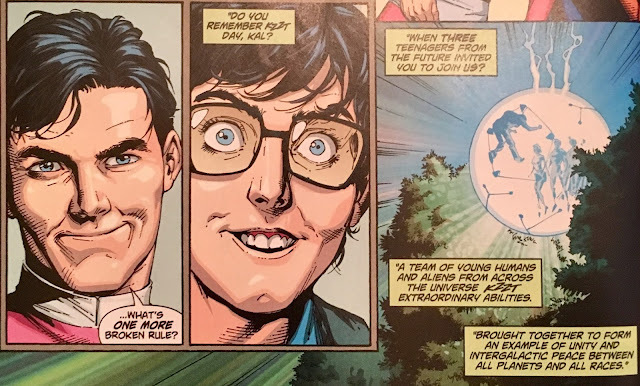 He then lambastes Clark for hanging out with Jimmy instead of people his own age. Wow. 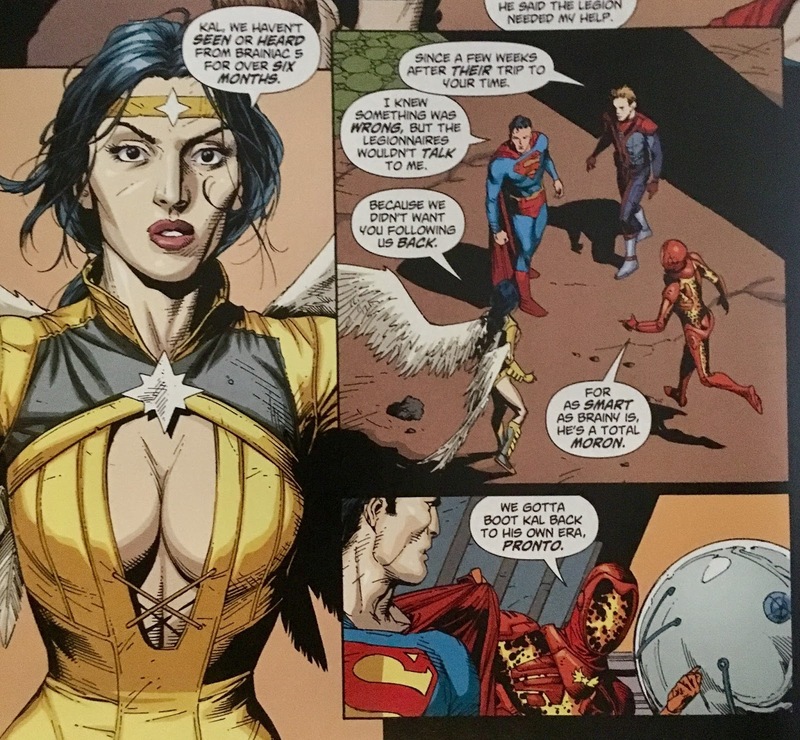 I really forgot how geeky they made Clark post-Infinite Crisis! 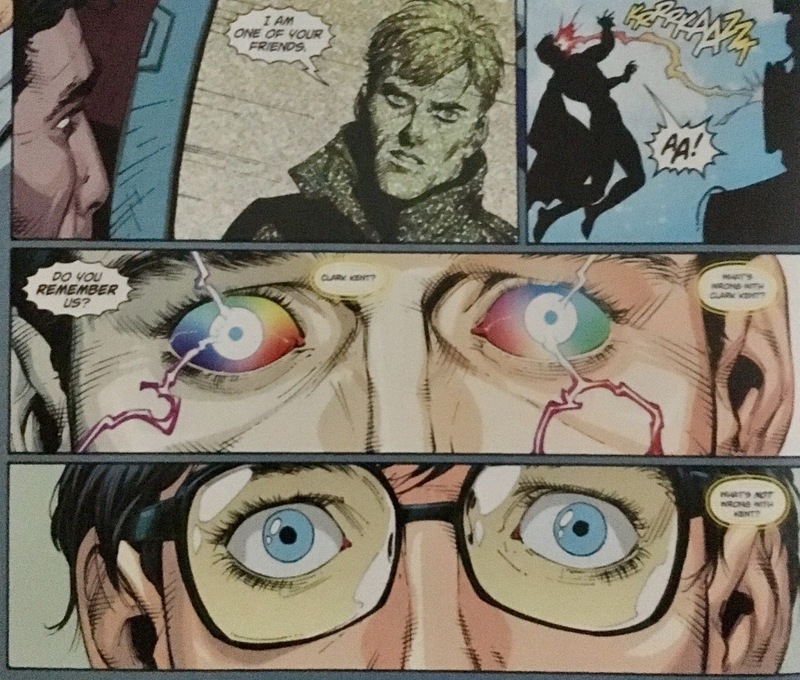 Anyhoo, while Perry reams him out, Clark can see a giant Brainiac robot approaching via his x-ray vision. He excuses himself, citing "indigestion" and runs off to change clothes... and confront the big bot in the park. Suddenly the robot's head opens, revealing a monitor... on which, Superman is greeted by Brainiac-5! 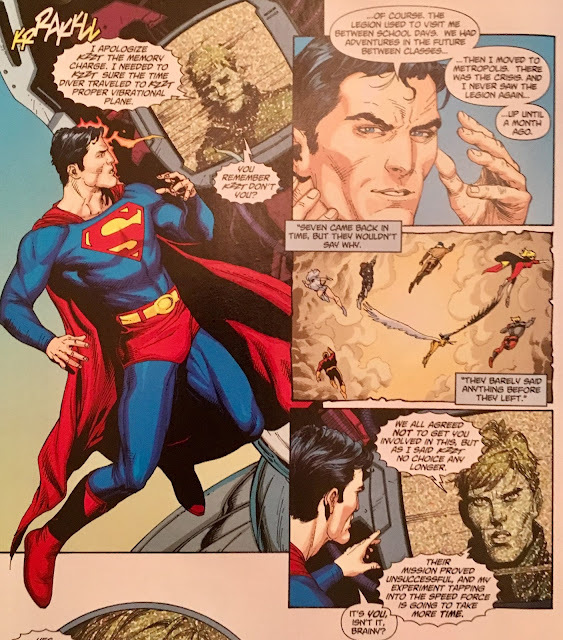 Superman doesn't immediately recognize him... which... hmm... okay, we'll play along since it facilitates the flashback we're about to experience. 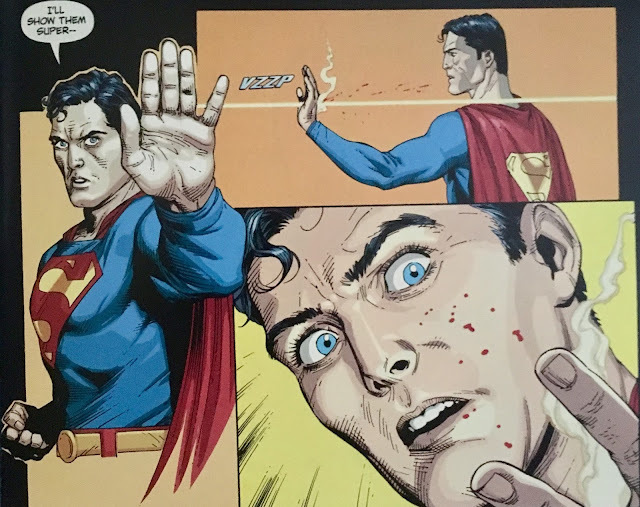 After being zapped with "memory", Superman flashes back to his childhood. At least I think it's his childhood... though, it could easily be confused for Peter Parker's. Long story short, he's a nerdy outcast who really creeps his classmates out. Nope... don't like that. Once he's out of his peers sight, he proceeds to do the whole super-powered kid thing... running really fast, jumping really far... even flying. It's on this day that he is approached by three gaudily-dressed, and chipmunk cheeked kids from the future! It's a bit different from the first time around, but we'll allow it. They thank Clark for the inspiration he will one day become... which feels a whole lot like "mucking with the past", but what do I know? 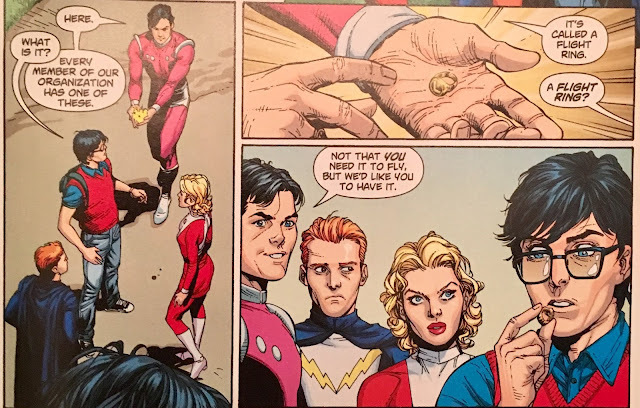 To make him an honorary member of their "organization" they present him with a Legion Flight Ring. They go to leave, but Clark stops them... asking if he might come along. After some hemming and hawing, Lightning Lad is able to talk Cosmic Boy into giving the thumbs up. 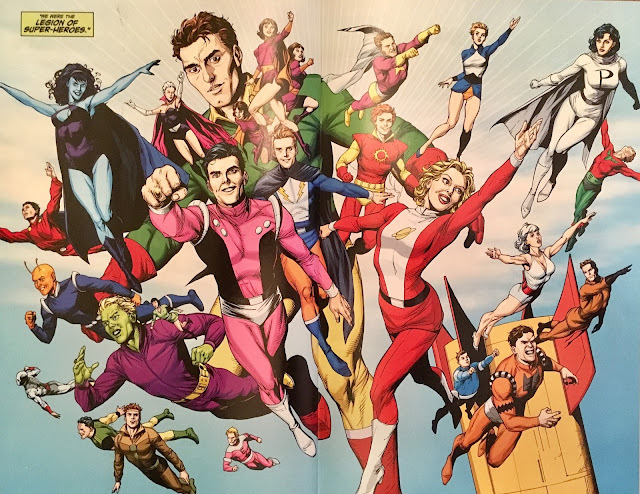 From here we get a two-page spread of the Legion of Super-Heroes... as this was their genesis... or at least a modified re-telling of their first appearance(s). 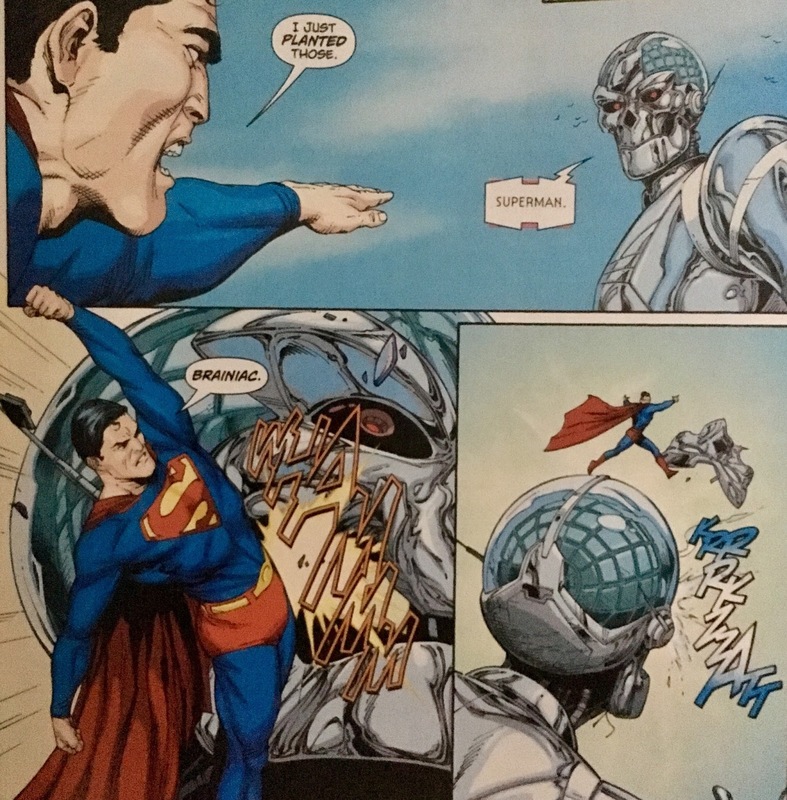 Brainy-via-Satellite apologizes for imposing himself on Superman there... and asks if he remembers everything now. Weird, I could'a sworn he remembered everything toward the end of the recently-ended The Lightning Saga. Anyhoo, Superman reveals that following the (first) Crisis, he'd forgotten all about his adventures with the Legion of Super-Heroes... and even mentions that recent Lightning Saga as part of his memory-jogging. Brainy now gives him the real reason he's here... the Legionnaires were unsuccessful in their latest mission, and are in need of some Super-assistance. The Brainiac-bot opens up some more revealing a Time Bubble... and more importantly, a Legion Flight Ring. 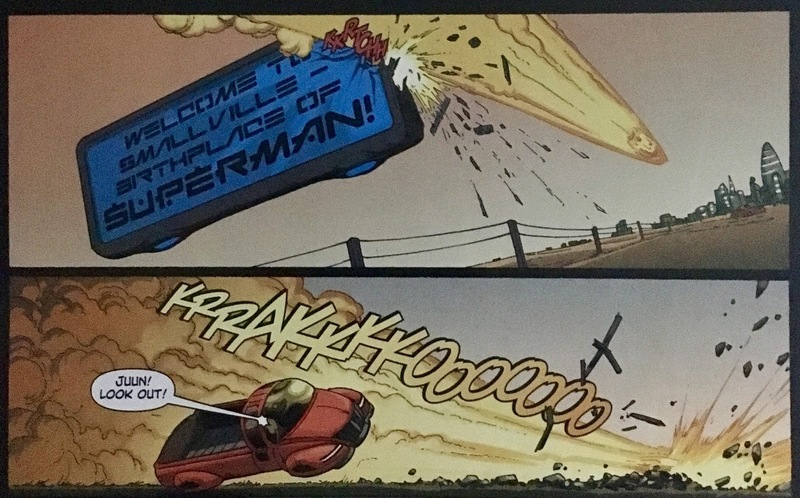 I could'a sworn they mentioned that Superman already had one during The Lightning Saga. Oh well, he slips it on his finger while Brainy begins to fill him in on the details... something went down in the Arctic... and that's all we get before the Time Bubble booms-out. 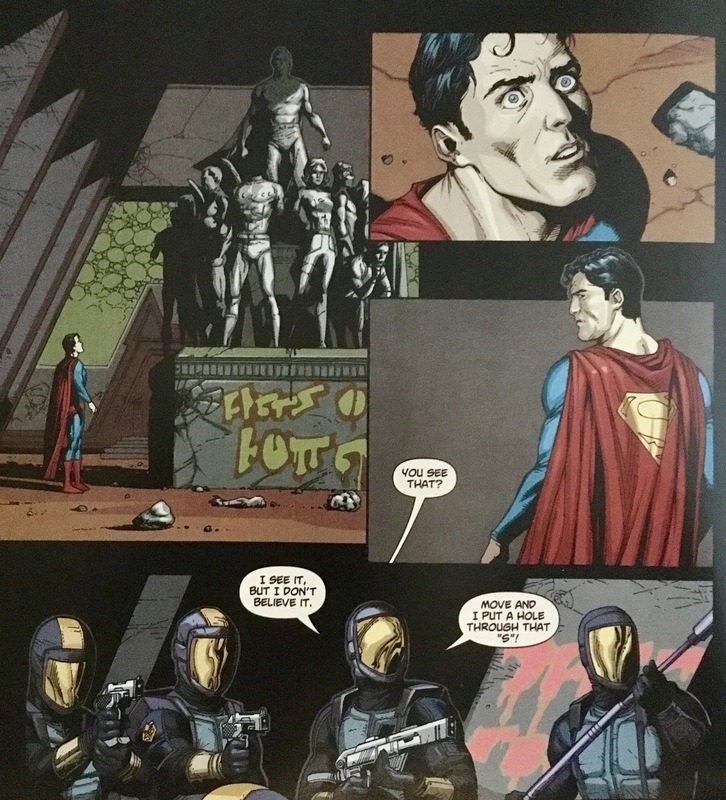 Before we know it, Superman finds himself at the old Legion Headquarters... now in quite a state of disarray. There's some Interlac spray-painted on a statue of the Legionnaires (which must be from the advanced class, because I can't seem to translate it). As he looks around, Superman is approached by a gaggle of officers... who threaten to fire if he doesn't stand down. A confused Superman becomes even more so when Colossal Boy crashes through the wall to make the save. He is flanked by Wildfire and Dawnstar... who bring even worse news. They haven't heard from Brainiac-5 in over six months... and insist Kal hop back into the Time Bubble and vamoose back to the present. ... which doesn't go all that well. Ya see, it turns out in the year 3008, the Earth's Sun has gone RED. Well... kind of a mixed bag. Let's start off with the new-look Clark Kent. 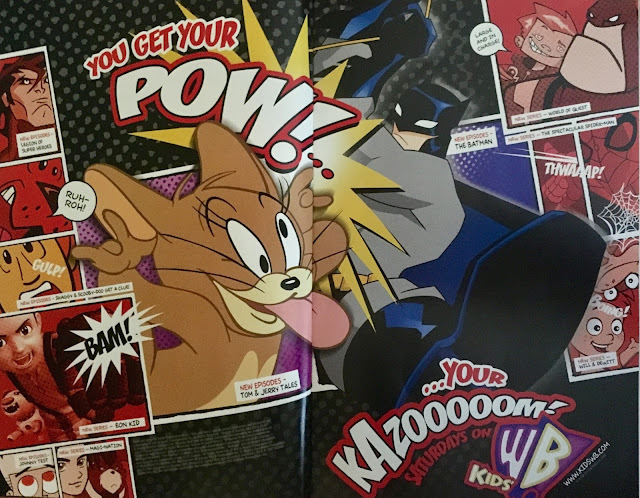 I'm definitely not a fan of them turning him into such a goober post-Infinite Crisis. I mean, even back in the Silver-Age (when protecting the secret identity often felt more important than saving the world) he didn't come across this nerdy. Here, he's a dude you'd avoid interacting with... such a mess. I prefer him being a respected reporter at the Daily Planet, and not the office pariah... and the poor geek everyone makes fun of. 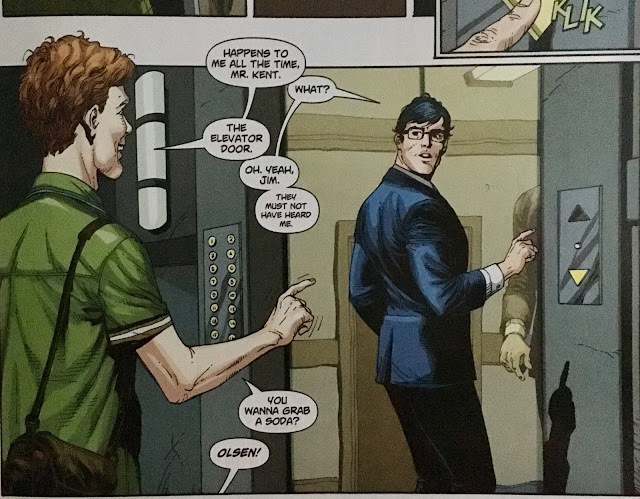 Also, I certainly don't see Lois Lane ever being interested in this version of Clark. You gotta figure, if Clark's the office joke... and she's married to him, people have gotta be ragging on her too! Don't see her standing for that. New Perry... wow... this guy's a jerk. Growing up post-Crisis, I always looked at Perry as something of a father-figure for not only Clark, but Lois and Jimmy as well. Here, he's almost a cartoon bag of bluster. So detached from his staff... and so focused on "getting the paper out", he loses a whole lot of his humanity and what made him such a special part of the cast for the quarter-century prior. I see Perry as thanking Clark for hanging out with poor Jimmy... not lambasting him for it! Then... there's Clark as a kid. Why does he have to be that weird outcast? 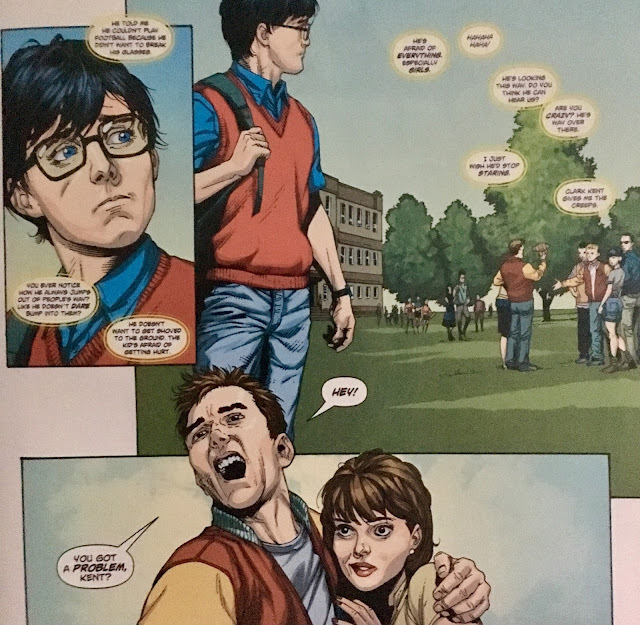 Isn't kind of the point of Superman that despite being a literal alien, his being raised by the Kents never made it feel like it? I always picture him as being a well adjusted child, who was at least semi-popular. Here, he might as well be Peter Parker with a better haircut. 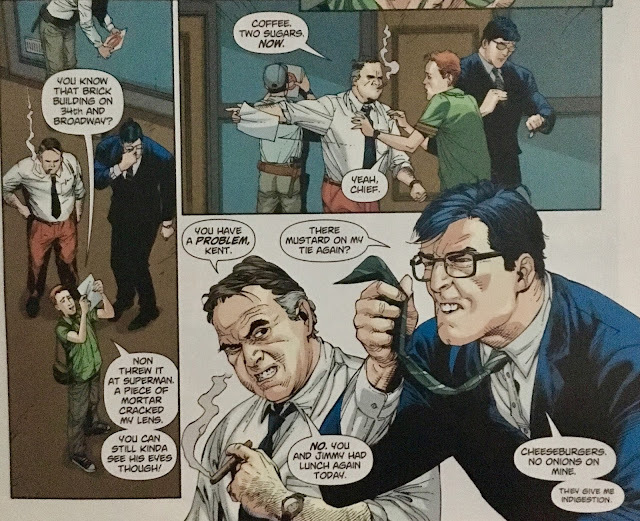 Not sure this wrinkle is necessary... don't see what's so wrong with making Clark just an ordinary (non-ostracized-for-being-creepy) kid. Seems like we're adding tragedy/adversity just for the sake of it... and I can't say that I'm a fan. The Legion's arrival in young Clark's life gets a bit of an overhaul... which, I suppose if you feel the need to modernize it... it's fine. What I don't quite understand is how elements from The Lightning Saga have already been forgotten. 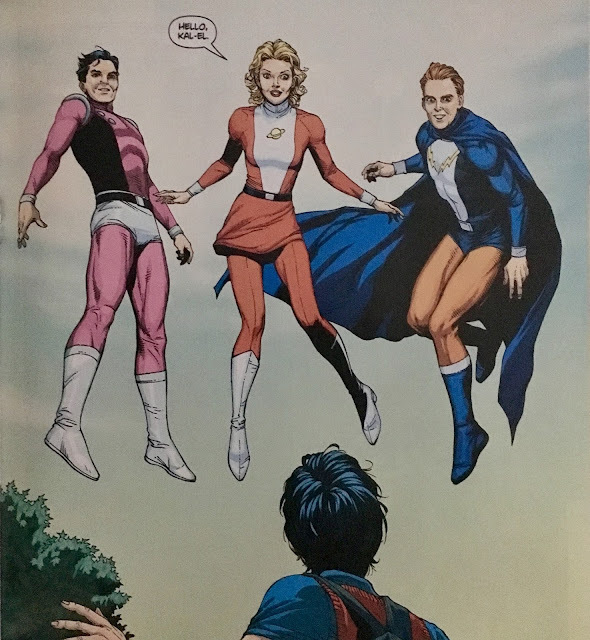 Hell, the second-to-last chapter opened with Superman positively gushing over his adventures with the Legion... even chatting up specific ones. I'd blame that on being a Brad Meltzer chapter... but, nope... it was a Justice Society one. The future story... is intriguing! I'm definitely interested in seeing how this works itself out. 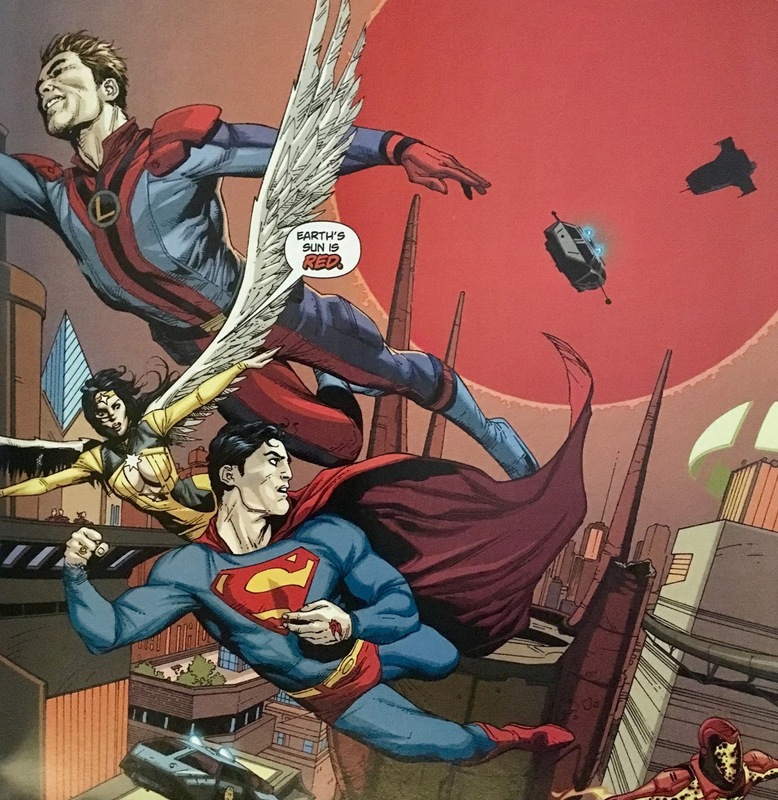 Seems very much like a story Johns wants to tell... and shows a lot of reverence for the Legion (except for that already ongoing Legion of Super-Heroes title that was hitting the shelves while this arc occurred). Either way... I thought it was quite interesting. Then there's the art. This book goes from looking amazing to creepy-as-hell, in some cases from panel to panel. Frank's Superman is clearly modeled on Christopher Reeve, and that's all well and good... but, man... sometimes it looks really creepy. Also, so many of the characters here have that sunken-eyed chipmunk-cheeked look... it's as though they're all on heroin. It's not in every instance, but it's enough for me to notice. Still a big fan of Gary Frank, loved his work on Peter David-era Incredible Hulk and post-J. Scott Campbell Gen¹³... amazing talent. Just here, it got a biiiiiit sketchy. 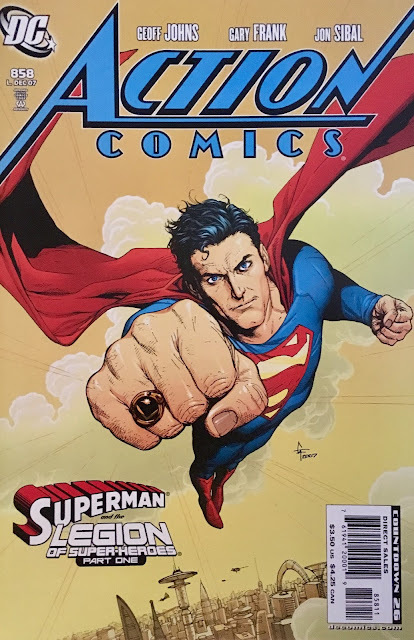 Overall... despite my complaints, this is one I'd recommend checking out if you have any curiosity about the Legion or post-Infinite Crisis Superman. It's been collected in trade and is available digitally. I bought these new and I think they are what shutdown my interest in collecting Action any further. That art...yuck!